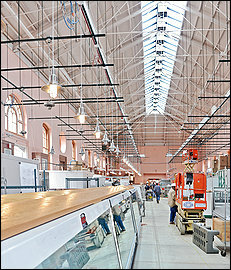 On April 30th 2007 the market at Eastern Market experienced a devastating fire to it’s main facility. Initially vendors, exhibitors and devotees feared that the landmark would not re-open. Originally built in 1873 this historic facility was long overdue for a face lift, fortunately plans were already underway and money had been set aside to undertake such a major renovation. Since the 2007 fire temporary quarters have been set up for food vendors and art exhibitors to continue this Capitol Hill tradition while the renovation project was underway. Eastern Market will have a lot of new touches when it reopens more than two years after a blaze that stunned the DC community. The $22 million rebuilding project has created a facility that is more structurally sound and truer to its original luster. Architects searched records from 1914 at the National Archives to make sure they had historically accurate lampposts, arches and windows true to the original design. The inside walls will even reflect the original paint color – salmon. Classic Glass has been exhibiting it’s work all summer long showcasing different styles and products such as stained glass transoms and backpainted kitchen back-splashes. We are proud to be apart of this weekends festivities and look forward to seeing the renovated Eastern Market and all it’s grandeur. The ribbon cutting ceremony will take place on Friday June 26th by Mayor Adrian Fenty with festivities continuing on Saturday and Sunday. This entry was posted on Friday, June 26th, 2009 at 8:42 am	and is filed under Decorative Glass. You can follow any responses to this entry through the RSS 2.0 feed.Both comments and pings are currently closed.